Paperback, 8.5 x 11.5 in. / 192 pgs. 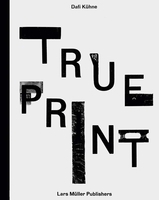 Eighteen internationally reputed designers were interviewed by the editors Inge Gobert and Johan Van Looveren. 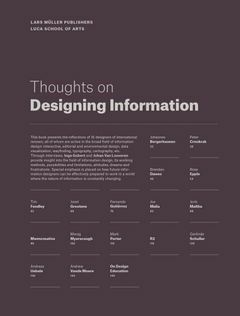 All are active in the broad field of information design: interactive, editorial, and environmental design, data visualization, wayfinding, typography, cartography. 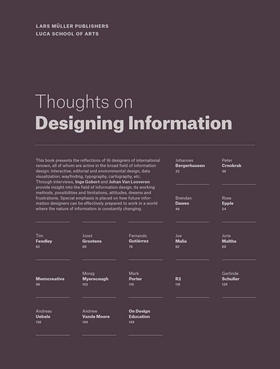 This book contains reflections on the field of information design and its boundaries, working methods, client-designer relations, attitudes, dreams, and frustrations. Special emphasis is placed on how future information designers can be effectively prepared to work in a world that is supposed to provide constant access to information. Interviews with: Johannes Bergerhausen, Peter Crnokrak / The Luxury of Protest, Brendan Dawes, Rose Epple, Tim Fendley / Applied, Joost Grootens / Studio Joost Grootens, Fernando Gutiérrez / Studio Fernando Gutiérrez, Joe Malia / BERG, Joris Maltha / Catalogtree, Morag Myerscough / Studio Myerscough, Maria da Gandra & Maaike van Neck / MWMcreative, Mark Porter / Mark Porter Associates, Lizá Ramalho & Arthur Rebelo / R2, Andréas Uebele / Büro Uebele Visuelle Kommunikation, Gerlinde Schuller / The World as Flatland, Karsten Schmidt, Andrew Vande Moere, Marius Watz. FORMAT: Pbk, 8.5 x 11.5 in. / 192 pgs.